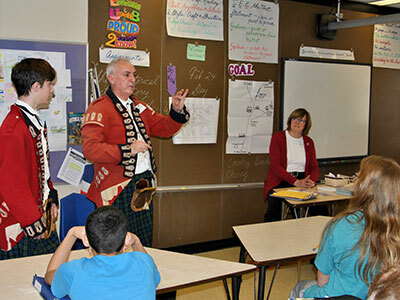 Following the reading of “My Brother Sam is Dead,” set in the Tory town of Redding, CT, during the American Revolution, seventh-graders in Debra Leporati’s ELA classes were ready for a life-like connection with that distant period of history. 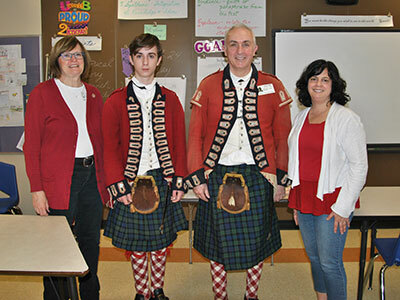 Courtesy of the Warwick Historical Society, guest-educator Mary Ann Knight, and Revolutionary War reenactors Michael Young and son Luke, the American Revolution came to Warwick’s middle school through storytelling around local landmarks and historic artifacts. 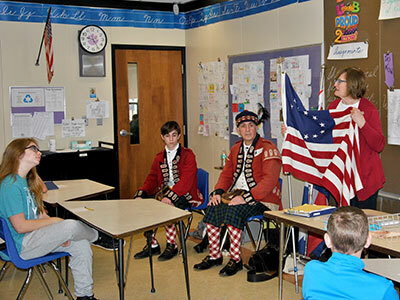 Replicas of the Betsy Ross flag, known as the Patriots’ flag, and the Union Jack Flag, told a human-interest story about the tavern boys of Baird’s Tavern. A toy-size “friendship basket” was a conduit to the story of the many Native Americans who left the area during the same period, after living here for thousands of years. Before moving West with her family, a Native American girl made the basket as a parting gift to a friend her age. The recipient was a member of the Benedict family. Representing the 42nd Scottish Royal Highland Regiment, part of the British Army, the reenactors wore exact replicas of their 1776 uniforms and shared such artifacts as a water canteen and a musket ball. Warwick’s Kings Highway, Baird’s Tavern, the Shingle House, and Hathorn House, will never look the same. They now evoke the stories of local people: Frances Baird, the Burt family, the Benedict family, John Cowdry, who would also take part in the Boston Tea Party, and John Cherry, the first Warwick young man to die in the war. Inspired by what they read and learned, the students will now create their own historical fiction story, set during the Revolutionary War in Warwick.